Should you wish to join in on a scheduled trip, please see our availabilities. Scheduled departures you can join. In a few moments, our availabilities for tomorrow and the day after. Pick your itinerary if you would rather charter a boat and run along your own route. Pick one port of call for each day of cruise1. For instance, for a two-night cruise, pick the place of departure, the port of call on day two, and the destination. The trips between Chau Doc or Vinh Xuong and Phnom Penh are extensions on board speedboats. Just fill-in the form, or simply click on your chosen ports of call on the map on the right. Mistaken? Or would you like to start afresh? Just reset the form, or correct the port of call with its drop-down menu. Are you feeling lost? See our animated map of the Mekong Delta to get some hints about the possible destinations. See also our daytime cruise programs. Enquire or book a trip along Chợ Mới - Cái Bè - Mỹ Tho - Sa Đéc. Boarding at noon in Cho Moi, welcome drink, introduction to the ship and crew. Lunch is served as the Bassac gets under way towards downstream of Song Ho (the river of the Tiger) in a scenery of fish-farming nets. Early afternoon, visit of a XIXth century monastery and convent still alive, and of the nearby countryside. Boarding back before dusk, with a welcome drink, to get under way towards My Thuan. Dinner is served while on the way along the Mekong by night. The Bassac drops anchor in view of the broad My Thuan bridge for the night. Breakfast is available from 6:30 on. 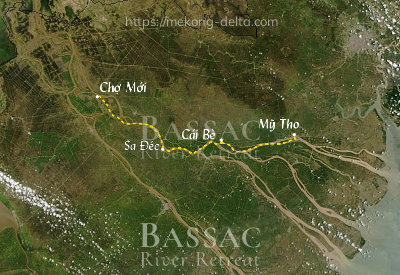 The Bassac sets sail towards Cai Be, crossing the My Thuan bridge and turns into a smaller branch lined with mangrove. Arrival near Cai Be, transfer to a rowing boat for a quiet visit through a small canal. Rendez-vous with a local boat, which will take you to shore for a visit of Cai Be's handicraft. boarding back at noon, with a welcome-back drink. Lunch on board as the Bassac is en route towards Binh Hoa Phuoc Island. Rendez-vous with a local boat to visit an old colonial house and an orchard garden on the Island. Boarding back before dusk. Refreshment drink then departure towards My Tho. Dinner is served en route. The upper deck welcomes you for a cool evening, why not with a drink. The Bassac drops anchor for the night in front of the Ben Tre islands. Breakfast is available from 6:30 in the morning. Mid-morning, transfer to a local boat for an extensive visit of the Ben Tre islands: rowing through the arroyos shaded with water coconut trees, on a horsecart through to a honey farm where you will taste the local production, especially honey tea. Arrival at Mỹ Tho late morning. Boarding back at noon, refreshement as a welcome back. Departure from My Tho to Cai Be then to Binh Hoa Phuocc Island while lunch is served on board. Transfer onto a local boat for a visit of the gardens and orchards on the bank of the peninsula. Back on board, a refreshment awaits you. Dinner is served as the Bassac gets under way towards the My Thuan bridge then drops anchor for the night. Breakfast is available from 6:30. The Bassac gets under way for a short run towards Sa Dec.
Check-out and transfer for a visit of the town of Sa Dec, following the tracks of French novelist Marguerite Duras. End of services by mid-morning on shore at Sa Đéc. Please note you will leave the Bassac for good upon boarding the small boat for the last visit, typically about 8:30. The details of the program and the visits may vary depending on logistics or technical constraints.